My session is co-delivered, brief, and focused, containing less in terms of content and more in terms of dialogue. I found this was a much more effective experience for the attendees at the recent Charity Learning Consortium event. My session has a few themes. For example, the conversation about whether L&D should be at the table is becoming wearing. Whilst L&D is defining itself by its language, jargon, happy sheets and innovative tech solutions, people in the business are getting on with business. As I’m saying this morning, it’s not about asking what the business can do for you, but looking at yourself and your function and asking what you can do for the business. I suggest L&D will become extinct as a function – it’s not rocket science. The market for formal interventions around a compliance base are diminishing with every passing season. Training to a ‘just in case’ mentality is becoming less required. Why would I want an expensive course/content piece when I can set an expectation of compliance with the individual and manage it in the performance space? Realistically, as we move into more tech enabled and flexible working patterns, a desire to want to control everything that people learn is becoming more of a pipe dream. The way that people can access content at a time they need, on a device they own, in a context they own, challenges the relevance of a traditional training function. If I want to develop my practice, I can have a Google Hangout with a dozen people around the world on a Tuesday evening in my home, or I can sit in a room being talked at for half a day. Which is more relevant to me? In a recent conversation with a colleague I suggested that information is free but knowledge isn’t. The act of changing information to knowledge is the space where learning happens and as people have access to a wider and deeper flow of information, the points where the L&D function can influence that change have increased exponentially. It’s a horizon of opportunity but what I see in practice is L&D professionals and businesses attempting to limit access to these information flows. Bad luck. That horse has bolted. I’m also talking abpout the workforce of the future. My son is 13 years old and plays Minecraft. If you think this is just a toy, think again. He connects with people around the world, working collaboratively to agreed objectives. He manages resources and prioritises activities, working on a project by project basis. He communicates via keyboards and gestures, has a shared vocabulary and way of working. He’s learning at his pace from his peers. If he wants to understand how to do something in the Minecraft world he looks it up and watches it via Youtube. He’s created worlds with no formal input and through learning from his peers. In 5 years time my son could be your employee. He will expect the same freedom to learn in the workplace that he has in the Minecraft space as he develops his critical thinking skills. Are you ready to help him develop in the way he wants? If you don’t, he won’t stay with you and you’ll lose his talent. 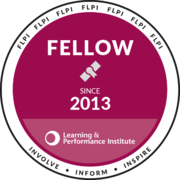 Are you a learning practitioner of the future? Are you able to adapt and evolve? Tell me how you do it in the comments below. ← What can you achieve in 40 days? Really great conference and your session has got me thinking about how we ‘fence in’ our learning and only offer the content if you attend the formal course. Personally I learn most, like you son, from online media and then putting it into pratice. Also thanks for taking the time to talk about the contents of your session at more length. I’ve got a slot with mt manager to discuss a new social approach for our next course, will let you know how it goes! Almost a month on from your comment – how did the manager meeting go?